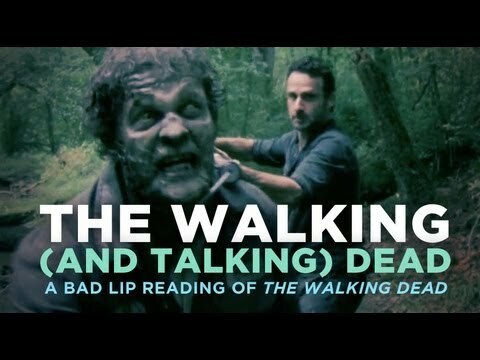 Have you ever seen the Bad Lip Reading videos on YouTube? They're so great that I can watch them dozens of times, like an episode of Friends, except these make no sense at all. The NFL one was the first I saw and the best. But "The Walking and Taking Dead" just surpassed it for what I assume is a little nod to David Morrissey's time in the musical mini series Blackpool, which I still need to see. I've watched a clip here and there over the years because David Tennant was in it. I wish it would come to Netflix streaming, but I guess I'll have to buy it now. Two of my favorite guys are in it, so I can't put it off for too much longer. I would have mentioned this when it was uploaded earlier in the week, but I was busy writing a post about TWD that I've been putting off for months. I also spent my free time watching the video over and over and making a few clips to use in place of a few Win8 system sounds. I would have saved a couple minutes on one of them and downloaded the official ringtone if I'd noticed the mention in the description. I think I'll buy it anyway, because these people deserve to be compensated for so much laughter.